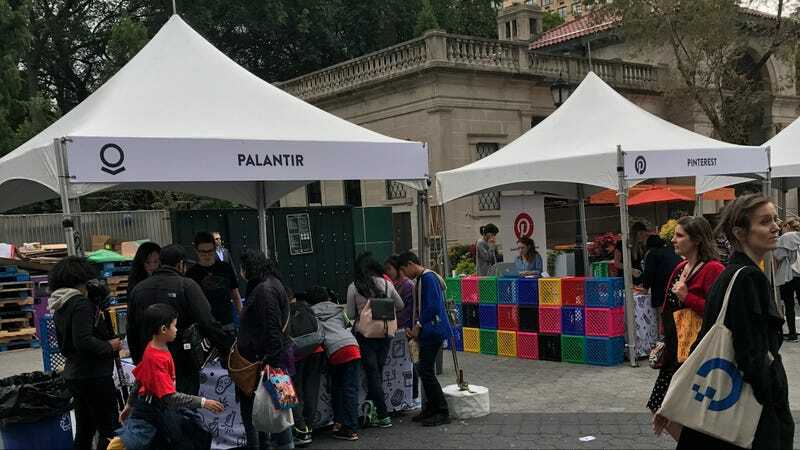 Palantir, a secretive startup funded in part by the CIA’s investment arm In-Q-Tel, had a booth at Google’s “Geek Street” fair in New York City’s Union Square today. Facebook, Google, Samsung, and Pinterest also had booths at the event, but those booths certainly didn’t feel as weird as Palantir’s presence. That’s because Palantir collects massive amounts of data, including in New York City, and also sells its data analysis services to companies like Bank of America, BP, Morgan Stanley, Walmart, and Northrop Grumman. The company is currently valued at $20 billion. It was co-founded by Peter Thiel, Facebook board member, Donald Trump delegate, and funder of a secret campaign to destroy Gizmodo’s former parent company, Gawker Media. Palantir employees at the booth were giving quizzes to kids about some basic computer science concepts, and giving away sweet Palantir-branded merchandise like sunglasses and pens. I’m sure they had good intentions, but seeing a bunch of elementary school children crowded around a Palantir booth, in their Palantir-branded shades, felt like a scene from the beginning of some dystopian movie. We’ve reached out to Palantir and will update this story if we hear back.